At BooKoo Bounce, your party is a piece of cake! 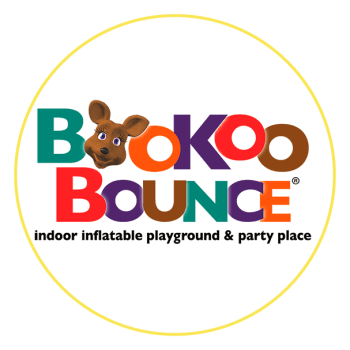 The best plan you can make for hosting a party is booking your event at BooKoo Bounce. BooKoo Bounce provides the absolute easiest, funnest, and best quality event for you and your guests! Best of all, birthday parties at BooKoo Bounce are PRIVATE. Your party areas are for only you and your guests EXCLUSIVELY! 40 minutes in Arena A, which contains 4 - 5 of the best inflatables ever! 40 minutes in Arena B, which also contains 4 - 5 amazing inflatables! 40 minutes in your private party room ~ where your guests will enjoy pizza, cake, and refreshments and sing "Happy Birthday"
We do not allow temperature-controlled foods, warmer trays or crock pots to be brought in. However, a sandwich tray, veggie-tray, cheese-tray and some bags of chips, pretzels, goldfish, etc are allowed. We even provide the serving bowls for the chips. No temperature controlled foods, please. The steps that you wont miss? Cleaning the house again... AFTER the party. Our private party rooms are modern and roomy, offering a great environment for kids and adults alike to relax comfortably. Plenty of seating is available. - Comfortable lounge areas feature big screen Hi-Definition and 4K TVs. - And, of course cool music in the background. It’s never too early to reserve your party date and time. Book early! Because once your date & time is gone, it’s gone! A $100.00 deposit is required to reserve your party date and time.